Refreshing, nourishing, and oh so delicious! This super green kefir smoothie is high in vitamin C, potassium, calcium and healthy fats, thanks to the avocado, kefir and kiwi. Add all ingredients to a blender and blend until smooth. 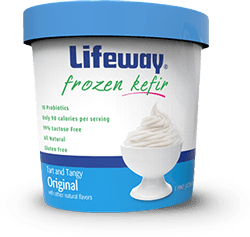 Additional frozen kefir or ice may be added for consistency. Garnish with fresh mint leaves or additional kiwi slices.